The city of Kanzawa, the capital of Japan’s Ishikawa Prefecture, has long been an important center for traditional arts and aesthetics. Visitors flock to the town’s beautiful Kenroken Garden, as well as its preserved samurai and geisha quarters. Kanazawa has also long been a center for goldsmiths, due to the deposits of the precious metal that can be found in Ishikawa, and to this day produces a variety of objects covered in exquisite gold leaf. Recently, though, Kanazawa is attracting attention for something just as desirable as gold in some people’s eyes: delicious ice cream-filled melon bread. As we’ve mentioned before, melon bread is one of Japan’s most unassuming yet mouth-watering snacks. Given that the sweet half-spherical pastries don’t necessarily have to even have even a hint of melon in them, there’s quite a lot of leeway for creative bakers to play with, including adding chocolate chips or cream filling. Sticking a scoop of ice cream inside a piece of melon bread is a bold new world, though, which is why the Kanagawa bakery that came up with this ingenious double team is selling 200 such treats every weekday, and more than double that amount on weekends. ▼ Even in Japan, where you can often spot lines outside the most popular restaurants, when you find a 30-meter (98-foot) queue, you know they must be serving up something tasty. Ishikawa gets incredibly hot in the summer, even by Japanese standards, which explains why the prefecture has the highest household consumption of ice cream in the country. Of course, when the people around you are setting the bar for how much they can eat, eventually they’re going to start looking for a new delivery system for transporting ice cream into their bellies, which is how ice cream melon bread started earning popularity when it was still being sold by its creator out of the back of a van. Eventually, the tasty two-in-one built up such a following that it required a permanent home, and the first of its two Kanazawa locations opened last August. The business’ unusual name, Sekai de Nibanme ni Oishii Yakitate Meron Pan Aisu no Omise, translates as “The World’s Second-Most Delicious Melon Bread, with Ice Cream, Bakery,” with the surprisingly specific humility being out of respect to the baker the owner did his apprenticeship under. Although it’s technically a pastry, melon bread isn’t nearly as sweet as a donut or muffin, and fans of the bakery’s creation say the ice cream stuffed inside has a similarly mild sweetness. There’s plenty of contrast in the textures, though, as the bakery’s melon bread has a crispy, cookie-like outer edge versus the obviously soft ice cream. Even more complexity comes from the difference in temperatures between the warm, freshly baked bread and the ice cream inside, and those who have tried the treat saw that one of the best parts is the way the cream melts into the bread as you eat it. The bakery isn’t done with its melon bread tinkering, either. Photo evidence exists of a version with chocolate ice cream, and the shop’s website shows that last November it offered a soft of croque-monsieur-style ham and cheese melon bread. Given that Japanese haute cuisine sometimes adds a few flakes of gold dust to food or sake, we’re wondering how long it’ll be until Sekai de Nibanme ni Oishii Yakitate Meron Pan Aisu no Omise decides to start adding some to its pastries. Of course, it’s not like there’s any rush, seeing as how their ice cream melon bread is already essentially a license to print money. 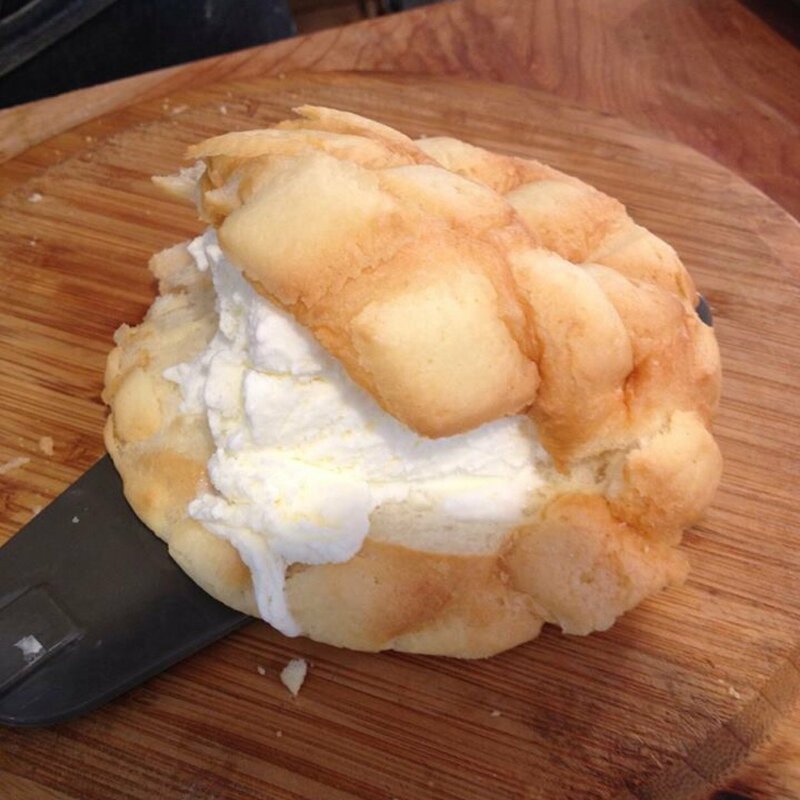 The perfect combination: meronpan and vanilla ice cream. Melon bread was my favourite treat when I spent one semester in Japan. The consistency and taste is just great and very delicious. Being a fan of mochi and after making the discovery that mochi plus ice cream is even better, I can just assume that melon bread plus ice cream must be a genius idea. I’ll definitely try and find this shop the next time I’m near.